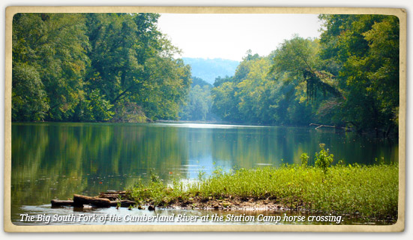 The 125,000 acres of the Big South Fork National River & Recreation Area contains hundreds of miles of trails and is recognized as one of the Southeast’s top destinations for equestrian trail riding. The network of trails takes riders through some remote and beautiful country in the wilderness of the Big South Fork, with scenery that includes rock houses, waterfalls, wildflowers and the Big South Fork of the Cumberland River. Trails In all, the Big South Fork trail system consists of 180 miles of trail. The trails range from easy, short rides that can be completed in a matter of hours to long, strenuous rides that require several days to complete. A negative Scoggins test for swamp fever is required to bring a horse into the park. Camping An equestrian campground is available at Station Camp, offering 24 sites. Each site is equipped with water and electricity, table, grill, tie-out for four horses, access to restrooms with hot showers, a dump station and immediate access to miles of horse trails. To make a reservation or for more information: (877-444-6777). Bandy Creek Campground offers 96 trailer sites with water and electric hookups and 49 tent sites, along with two group camping areas. Bandy Creek Stables adjacent to the campground offers boarding for horses for riders camping at the campground. Stall rentals and long-term boarding are available. For more information: 931-863-5769. Primitive camping in the backcountry is permitted as well. A Backcountry Camping Permit is required. Riders will have little problem finding suitable camping areas along the trail. Charit Creek Lodge Overnight lodging with meals is available in the Big South Fork backcountry at the remote Charit Creek Lodge. The lodge is accessible only by foot or horseback.